To celebrate Queen Elizabeth’s 60th year on the throne, Islay single malt whisky Laphroaig, is launching a special Diamond Jubilee commemorative edition. Bearing Prince Charles’ Royal Warrant, the 3,000 Jubilee cartons and bottles are set to become collector’s items. Laphroaig has also pledged to make a donation of £3000 to The Queen Elizabeth Scholarship Trust (QEST). 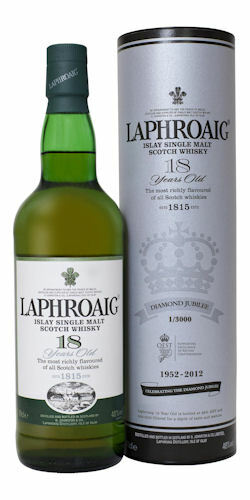 Each limited edition carton will display that it is only one of three thousand in existence and will contain the Double Gold Medal * winning Laphroaig 18 Year Old single malt (48% abv). Bright gold in colour, the Laphroaig 18 Year Old offers a toffee sweet flavour, accompanied by its trademark peat smoke taste. Laphroaig’s Diamond Jubilee bottling is especially fitting given their Royal Warrant, appointed personally by HRH Prince Charles when he visited the distillery in 1994. He also returned again in 2008 as part of his own 60th birthday celebrations. Reinforcing its special royal connections, Laphroaig is donating £3,000 to QEST. The charitable arm of the Royal Warrant Holders Association, the funds will go towards awarding craftsmen throughout Britain to help them further their careers, celebrating the excellence of British Craftsmanship as symbolised by the Royal Warrant of Appointment. Nose: At bottling strength, a soft toffee sweet, faintly spicy flavour counterbalances the trace of delicate phenols and fruit. There is an all-encompassing smoothness when these are all brought together. Adding a touch of water allows the seaweed and salt to come through but not enough to overpower the vanilla and honey sweetness with just a trace of new mown hay and peat at the finish. Taste: An instant warming tang of smoke that fades into smooth floral scents and blends seamlessly into an oaky nuttiness and leaves a lasting sweetness on the taste. With a touch of water the peaty warmth fills the mouth but does not overshadow the sweet chocolate smoothness. This is balanced by the rich toffee taste and slowly fades into a delicate hint of heather and peat smoke.